Ok here I am again, call me a stage Aunt (hahaha) I will be bragging about my nephew's achievement again in the world of blogging. I almost forgot to post about this one. As you might not know Juan Karlo of Pinoy Blogero is my nephew and he has been invited as a speaker in Blogging Events in the country. His technology blog PINOY BLOGERO that focuses on blogging can somehow encouraged or inspired his readers to start their own blog. In fact, his blog even won the Best Tech Blog at the recently concluded Phil Blog Awards 2. He won a trophy and a cellphone Nokia N-series as prizes. He is squeezing himself in studying (Computer Engr. in Mapua his last yr.), sideline job and his blogging. 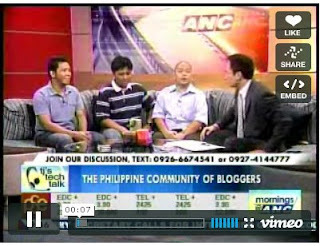 Anyway, he was invited along with his co-bloggers and winners Juned Sunido and Ferdinand Decena to guest last Oct. 9, 2008 on Mornings@ANC (shown on cable), and they were interviewed by host TJ Manotoc and of course we are happy and proud of him. We have not seen it live on TV bec. we have no cable but here is the interview that he posted on his blog.